The theme and text for each year's observance of the Week of Prayer for Christian Unity are chosen and prepared by representatives of the World Council of Churches and the Pontifical Council for Promoting Christian Unity. The texts proposed here were finalized during the meeting of the international preparatory group appointed by the World Council of Churches Faith and Order Commission and the Pontifical Council for Promoting Christian Unity, of the Roman Catholic Church. The meeting of the international preparatory group took place at the St. Christophorus Monastery in Saydnaya, Syria. Graymoor Ecumenical and Interreligious Institute, in its planning of these resource materials also invites ecumenists and church leaders of various religious traditions to contribute resource materials for celebrating the Week of Prayer of Prayer for Christian Unity. Acknowledgment of these authors appears with their text. In addition, acknowledgment is due to those who contributed in particular to various segments of these resources. Ms. Betty Maurovich for Spanish translations for editorial review of the Spanish text. International Preparatory group text, edited by Fr. Thomas Orians, SA, Editor, Week of Prayer for Christian Unity resources and Associate Director, Graymoor Ecumenical and Interreligious Institute and Fr. James Loughran, SA, Director, Graymoor Ecumenical and Interreligious Institute. Ms. Liz Matos, Secretary, Graymoor Ecumenical and Interreligious Institute, for the compilation of "Observing the Week of Prayer...", "Continuing the Committment...", "Resources for Ecumenical and Interreligious Understanding" and "Week of Prayer Available Resource Material." Mrs. Veronica Sullivan, Business Manager, Graymoor Ecumenical and Interreligious Institute, for editorial review and management of the business and distribution of the Week of Prayer for Christian Unity resource materials. 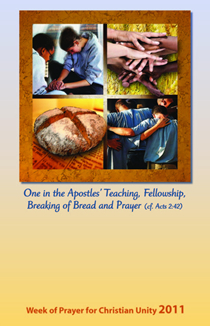 The translation of the biblical text in English used in the Ecumenical Celebration of the Word and Daily Prayer guide are from The New Revised Standard Version of the Bible, Anglicized Edition, copyright © 1989, 1995, by the Division of Christian Education of the National Council of the Churches of Christ in the United States of America, and are used by permission. All rights reserved. For those text in Spanish the biblical translation are from Biblia de Jerusalén 1999, Desclée De Brouwer Bilbao, and are used by permission. All rights reserved.